I had a chance to fish The Yampa River near Steamboat Springs recently and happy to report summer as usual fly Fishing on The Yampa. We fished the Chuck Lewis access just East of Steamboat Springs. Form Hywy 40 turn South on 131 towards Stagecoach Reservoir. This is a great area to run streamersand dry fly patterns. Another good summer option for Yampa River fishing is the tailwater below Stagecoach. When you fish this tailwater below the damn you can expect to see a few folks however there is plenty of water to find some nice fish. 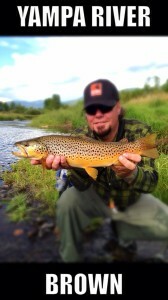 For information on guided fly fishing in Colorado & Yampa River fishing, call the shop at 720-851-4665.